This single line telephone is ideal for telecommuters and everyday office use. Features a 5-line, 29 character grayscale display, 24 programmable call appearance / feature keys and 9 fixed feature keys. Also includes a message waiting indicator, a built-in headset jack and a full-duplex speaker phone for audio conferencing. 9 Fixed Feature Keys: Conference, Transfer, Drop, Hold, Redial, Mute, Volume up & down, Speaker, Voice Mail. Single 10/100 BaseT Ethernet port. Support for Simple Network management Protocol (SNMP). Avaya Grey Color for all markets. 5 line x 29 character (168 x 80 4-grayscale) display. 24 Programmable call appearance/feature keys (arranged in 4 switchable display pages of 6 matching the 6 physical display buttons). Integrated 2 full duplex 10/100 BaseT switched Ethernet ports for connection to the IP Office and PC pass through. Auto-negotiation provided separately for each port. Phone has priority over PC port at all times. Note: The 5600 series will only work on Avaya IP Office release version 3 or higher. 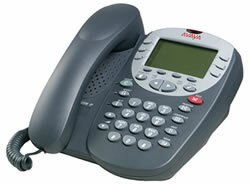 Back to the main Avaya 5600 series VoIP phone page.